One of the things that I am allowed to do, as both a member of the College of Arms and specifically as a Principal Herald is that I have an opportunity to promote heralds to a rank within the College of Arms called the Herald Extraordinary. This, per the July 1981 LoAR, found here, states the following about this august rank. While some of the other rankings, like Pursuivant and Herald have become passé in some kingdoms, like my own Calontir, others, like the Herald Extraordinary, have not. This rank entitles a herald to have a personal title, and shows they are an exemplar of spectacular heraldic service to the College of Heralds or the College of Arms. Over the weekend, I planned on making one of Calontir’s heralds a Herald Extraordinary for her exemplary work in her barony, her region, and for the work she has done for the Calontir College of Heralds for over 30 years. Below is the scroll I painted and calligraphed for Her Excellency Marie Chantal Delaire, with a scroll text written by my emergency deputy, Saito Takauji-san. Her Excellency has a French persona from about the 1400s. Uji and I worked together, with him writing a scroll text partially based on the Book of the City of Ladies by Christine de Pizan, who would have been a contemporary of H er Excellency’s persona. I went with a style that was en vogue for French illuminated manuscripts from the 1450s to about the 1500s with acanthus leaves, vinework, and plenty of decorated capitals. 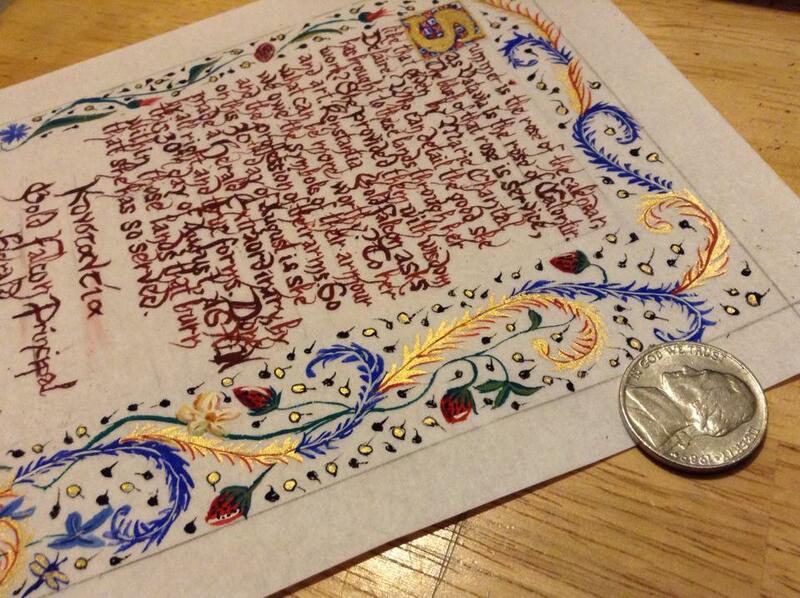 It is the smallest scroll I’ve done, as it is slightly larger than a postcard. As a left-handed person, I did find difficulty in doing the calligraphy. In fact, this was the final scroll out of four attempts, as I had issues with the scale and then the use of nibs and loose ink. On the other hand, once I figured out what the issues were, and reduced the scale (and the nib to a Crow quill) down, I actually ended up with a scroll that I liked and felt that I could actually be okay with someone putting it on their wall. For those who can’t read my calligraphy, the scroll text reads as such. Congratulations, Your Excellency! Please enjoy your new rank and title! 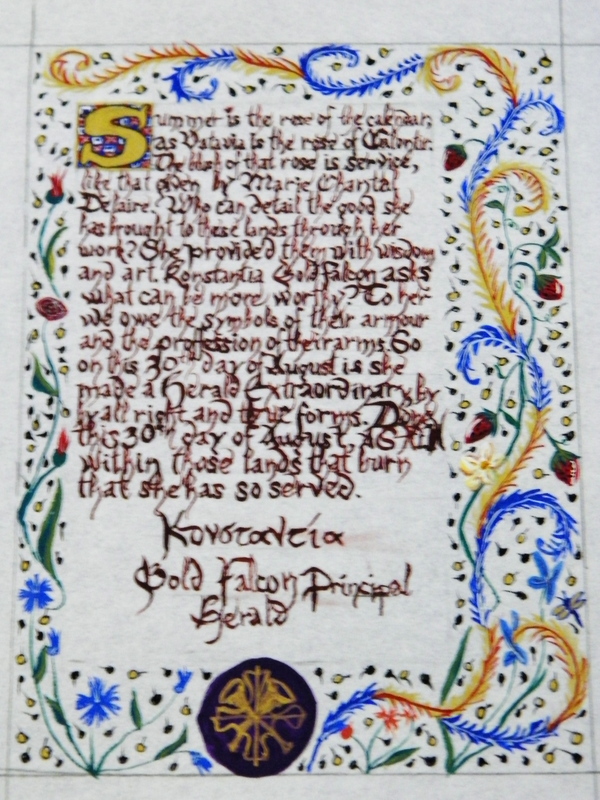 This entry was posted in calligraphy, herald, heraldry, illumination, later period, SCA, Society for Creative Anachronism and tagged 1400s, 1500s, acanthus, calligraphy, Christine de Pizan, france, french, herald, herald extraordinary, heraldry, illumination, renaissance, SCA, society for creative anachronism. Bookmark the permalink.